Behind My Red Door: I am smiling from ear to ear!! I am smiling from ear to ear!! Not one but TWO of my blogging friends have given me this sweet award! Cathy over at CATNABARN- and Sue from the COTTON PATCH given me the The Smile Award! Thank you ladies! I enjoy visiting you and I am honored! You make me smile! I still can't believe that people like to come and visit so much. I have always enjoyed peeking into people's homes and lives and never knew anyone else that was quite like me in that way, until I found Webshots and then blogging. What I like the most is that it connects me with people from all walks of life, from all over this great country and Canada. No matter whether we like prim, chabby chic, farmhouse or modern; whether we grow our own food and raise our own chickens or buy wholesale or at the local grocery; whether we home school or send our kids to public or private or Christian schools; whether we are single, newlyweds, long time married, widowed or divorced; whether we make our own things, shop until we drop or some of each; whether we have 1 bedroom or 5; live on the coast, in the heartland or somewhere in between, we all share some of the same fundamental human needs. And blogging or reading others blogs, reminds us of that and connects us all through cyber space in a way that was never possible before! It’s fun and exciting and heartwarming all at once. 2. You must post these rules if you receive the award. 3. You must choose 5 people to receive the award after receiving it yourself. 5. You must post the characteristics of a recipient. 6. You must create a post sharing your win with others. 1. Must display a cheerful attitude. (not necessarily at all times--we are all human). 2. Must love one another. 4. Must learn from other. 5. Must be a positive contributor to blog world. The 5 people I chose are.... now I don't usually do this part, but today I will. 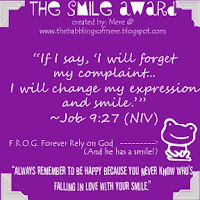 But if your blog is on my blog roll (and it needs updating because some of fav's aren't there - I've been so busy with the give away and life) it means YOU make me smile so grab this award too - PLEASE and tell them I said so! Mary over at Gettysburg Homestead - She makes me smile and laugh - she writes with such humor. And she I love watching her transform her home. She recently had a great tutorial on floor cloths so stop over and check it out!! Colleen over at And Baby Makes Five - Colleen always leave such sweet and cheerful comments for me. I love to see when she has visited and I love to visit her blog and see what's been going on in her neck of NE. She has 3 adorable kiddos! Wendy over at The Cozy Yellow House - Wendy and I first met on Webshots and she is a sweet gal and I love seeing her prim creations and prim home. It's so warm and welcoming. She is always cheerful when she visits and it makes me smile! Robin over at The Robin's Nest - Whether it's her hummingbird photo and quote, or a family story or a craft idea, this very creative lady has the neatest photo's and she is just so kind and sweet and I smile when I stop by or when she comes to visit! Cathy over at Cobblestone Farms - Another very creative gal, Cathy's blog always makes me smile. Right now the gorgeous sunflower header is enough to make anyone smile, but then to see the pictures of their farm, the events she decorates for and how she uses everyday items in the yard and garden, it's eye candy! Ladies, I know it takes time to post it so, I'll leave it up to you how and when you accept this! DH is working from home this morning and then he flies out to the corporate office in Chicago for a few days so I am off to make him a nice brunch and pack his suitcase. A few gals asked me what he does, and he works for a company that owns a patent for a process that takes coal an otherwise dirty fossil fuel, and in an environmentally clean and economical way, turns it into a source of natural gas called bluegas. From their website: " bluegas™ reduces U.S. dependence on imported natural gas and offers a completely clean alternative to burning coal to make electricity." It's very exciting and very needed in our country right now. I still haven't gotten caught up reading or updating my blog roll. After getting my Angel work done online, I am trying to finish up some small little things for a R.A.K. group I belong to over at the Primitive and Rustic Forum (see the link on the left somewhere), and I am hoping to finish my table runner for Whatcha Working on Wednesday and I desperately need to work in my garden while we FINALLY have some sunshine (YEAH!) and we really need some groceries! And I will leave you with a quote I heard on TV last night that just has me oh so giddy! Barry Burbank, a Boston meteorologist said: Those of you living in the Worcester hills should plan to get a blanket out - it's going to be THAT chilly later this week! NOW THAT makes me SMILE!! The perfect late summer day in NE! An award, my honey and money, and shopping! A very sweet and generous surprise!